A somewhat rare brooch closes out Ascot for us this year; the Irish Blossom hasn't been seen since 2014. It accompanied The Queen's fourth Stewart Parvin/Rachel Trevor-Morgan outfit combo of the week, a magenta hat and coat with a pistachio and rose dress underneath. With no winners among this year's runners, The Queen wasn't a lucky owner this year. How did you do in the Ascot Brooch Stakes? Did you have any winners? There weren't any surprises this year, which is always what I hope for. 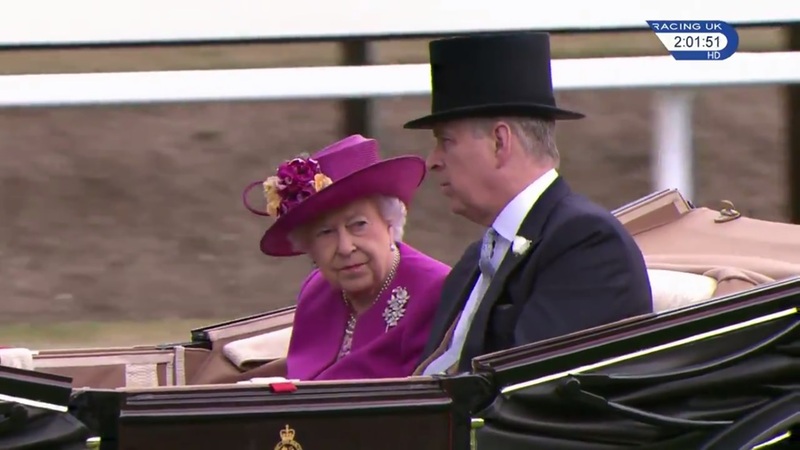 But I suppose our streak of Ascot brooch debuts had to come to an end at some point. The Flame Lily was the best brooch of the week in my book. Princesses Beatrice and Eugenie usually bring along their mother for one Ascot day. That day was Day 4, and orange accessories stole the show for both Eugenie (wearing a floral L.K. Bennett dress with a fab pop of orange on her shoes and a hat that I really wish was worn at a different angle) and for Beatrice (in her second Claire Mischevani outfit of the week with a Vivien Sheriff hat and a lovely orange clutch to tie it all together). Sarah, Duchess of York wore a hat previously seen on Eugenie and continued the Amanda Wakeley theme started by Beatrice on Day 3, sporting not only a similar dress from the designer but using the same apparent shirt-under-dress strategy. Listen, I have a CRAZY idea, it's really complicated but see if you can follow me: if you want a dress with an elbow-length sleeve...buy a dress with an elbow-length sleeve. Princess Beatrice turned up on Day 5 too, once again wearing Amanda Wakeley. And once again her accessories stole the show, adding interest with a colorful belt and carrying a purse that would make her granny proud. 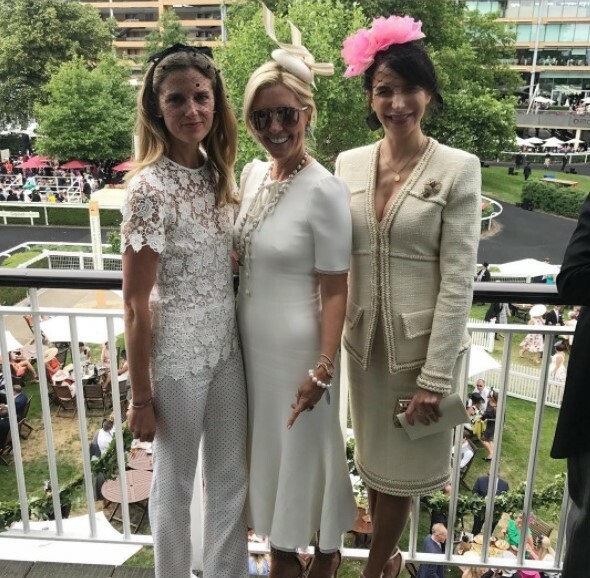 One last royal sighting for Ascot week: Princess Marie-Chantal of Greece! Smallest hat I've liked this week, and several rounds of applause for pepping up a simple white outfit with some long necklaces.